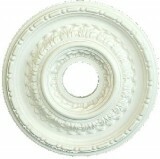 Polyurethane small rosette, most commonly used to fill in the opening on the other ceiling medallions on this site. If you happen the love the ceiling centre, but you do not have a light fixture, this is the perfect solution. 5" in diameter x approximately 5/8" thick. CC-RS-5 Line drawing. Simple center with Egg & Dart perimeter; 17 1/4" diameter X 1/2" thick with an opening 3 1/4"
Rope, Leaf and pearl ensemble ceiling medallion; 18"" diameter X 1 1/2"" thick. Opening 4"" to fit over a standard light box. 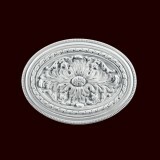 Acanthus Leaf Ceiling Medallion; 20 3/4" diameter X 1 1/4" thick with an opening 3.5"
Polyurethane Smooth 19" Ceiling Medallion with an approximate opening of 4". 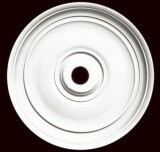 Polyurethane Smooth Ceiling Medallion 24" round with a 4" opening for the light fixture. 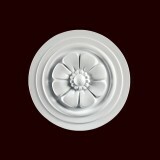 Simple center with a contemporary pearl perimeter; 24 1/4" diameter X 7/8" thick with an opening 4"
Ceiling Medallion with a simple center with Egg & Dart with rope perimeter; 25 3/8" diameter X 1" thick with an opening 3.5"
Acanthus Leaf Ceiling Medallion; 27 7/16" diameter X 1 1/8" thick with an opening 3.5"
Regent Ceiling Polyurethane Ceiling Medallion: 21 ½" diameter X 1 ½" thick with an opening a 1" opening. The opening can easily be enlarged on site to suit your light fixture.